California’s capital city just completed the world’s most environmentally sustainable arena, and Inhabitat was in town to tour the LEED Platinum solar-powered home of the Kings NBA basketball franchise. The Golden 1 Credit Union Center is the first indoor sports venue to earn LEED Platinum certification from the United States Green Building Council (USGBC), the highest designation possible. Perhaps the most impressive feature of the first professional sports venue to be completely powered by solar energy is the 1.2 megawatt rooftop solar array that will provide 15 percent of the arena’s electricity with the rest coming from the 11 MW Rancho Seco solar farm located 40 miles from the arena. The Kings partnered with the Sacramento Municipal Utility District (SMUD) on the solar farm that combined with the rooftop solar array will cut nearly 2,000 tons of greenhouse gas emissions annually. 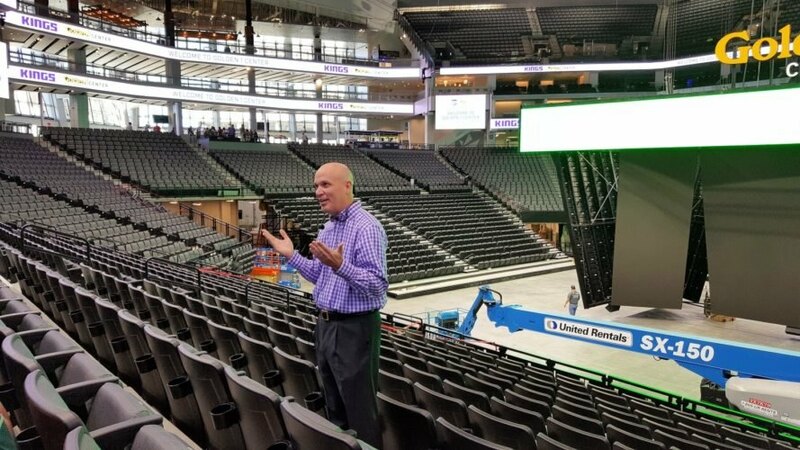 Kings President Chris Granger gave a tour of the arena’s sustainability features to journalists gathered in Sacramento for the Society of Environmental Journalists conference. He explained that the arena’s design is intended to be “uniquely Sacramento.” The Kings organization surveyed 20,000 people about what makes Sacramento unique. The city is known as America’s “Farm to Fork Capital” (the Farm to Fork Festival was taking place around the city during our tour) so 90 percent of the arena’s food is sourced from within 150 miles of the venue. Golden 1 Center Executive Chef Michael Tuohy told the reporters gathered that the arena’s kitchen is teaming up with a local group called California Safe Soil to recycle food waste into liquid fertilizer. The arena features a unique heating and cooling system, called “displacement ventilation,” that utilizes passive climate controlled air. Five 40-foot tall airport-sized hangar doors can open and naturally cool the arena with Sacramento’s “Delta Breeze,” a wind coming from the southwest, off of The Delta of the Sacramento River and San Joaquin River, that at night can cool the city by as much as 10 to 15 degrees Fahrenheit. When 17,500 Kings fans take their seats they might feel cool air at their feet. That’s because there are strategically placed vents underneath the seats that efficiently cool the arena from the bottom up. The air conditioning unit’s location beneath the seating bowl avoids cool air from the top colliding with the warmer air created by the body heat of thousands of ticket holders, wasting energy. The $556.5 million arena also includes ultra low-flow plumbing that captures grey water to irrigate the plaza. According to the Kings, the water conservation efforts will result in a 45 percent reduction in use over what California code requires. 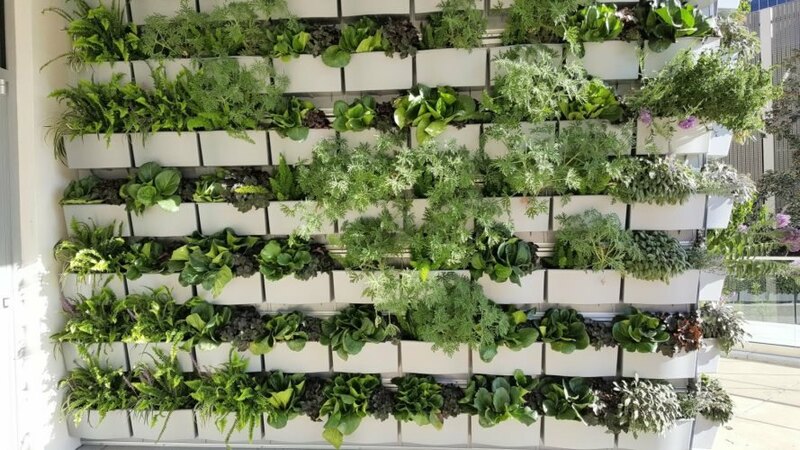 There are also living wall gardens lining the exterior of the arena consisting of local plants and edibles that are watered via a drip irrigation system from water runoff collected from the roof. When asked, Granger estimated that around 15 percent of visitors will walk, bike or take public transit to games. There are five Sacramento Regional Transit light rail stations within walking distance of the arena, including the 7th and K Streets stop a block from the venue. The arena also offers bike valet and there are bicycle racks surrounding the building. Sacramento is considering starting up a bike sharing system with a pilot program scheduled to begin in the spring of 2017. In addition to environmental sustainability, Golden 1 Center is the most technologically advanced sports arena in the world. Kings Chairman Vivek Ranadive has described the venue as “the Tesla of arenas.” High-tech features include smart turnstiles to speed up entry into the arena; a smartphone app to order food, request an Uber ride or find the shortest line for the restroom; a high-speed WiFi network with 1,000 access points; and the world’s largest indoor scoreboard and world’s first 4K Ultra HD video board. Spanning more than 84 feet, the total length of the video board will extend nearly the entire basketball court. The Sacramento Kings' new downtown arena is LEED Platinum and fully powered by solar energy. The Golden 1 Center is the most environmentally sustainable arena in the world. Kings President Chris Granger gave a tour of the arena's sustainability features to journalists gathered in Sacramento for the Society of Environmental Journalists conference. He explained that the arena's design is intended to be "uniquely Sacramento." Granger estimated that around 15 percent of visitors will walk, bike or take public transit to games. There are five Sacramento Regional Transit light rail stations within walking distance of the arena, including the 7th and K Streets stop a block from the venue. Golden 1 Center next to an older building in downtown Sacramento. Workers busy preparing the Golden 1 Center for its Oct. 4 opening when Paul McCartney performs. Golden 1 Center is the most technologically advanced sports venue in the world. Kings Chairman Vivek Ranadive has described the venue as "the Tesla of arenas." A 1.2 megawatt rooftop solar array will provide 15 percent of the arena's electricity. The Golden 1 Center recently earned LEED Platinum status from the U.S. Green Building Council. 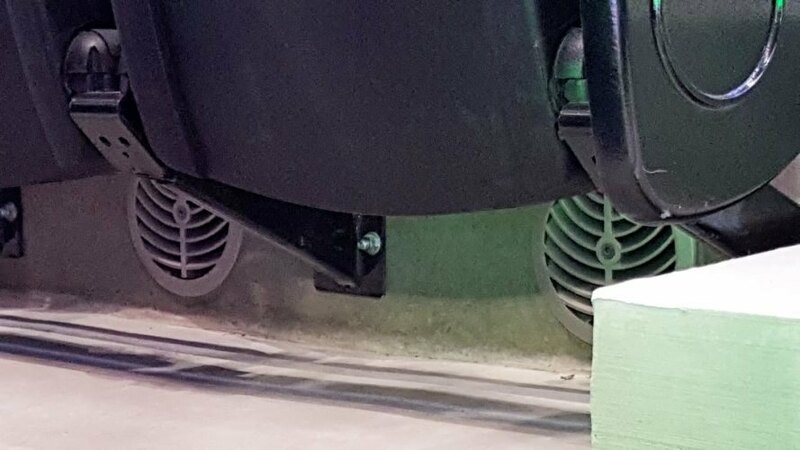 There are strategically placed vents underneath the seats that efficiently cool the arena from the bottom up. Golden 1 Center features the world's largest indoor scoreboard and world's first 4K Ultra HD video board. 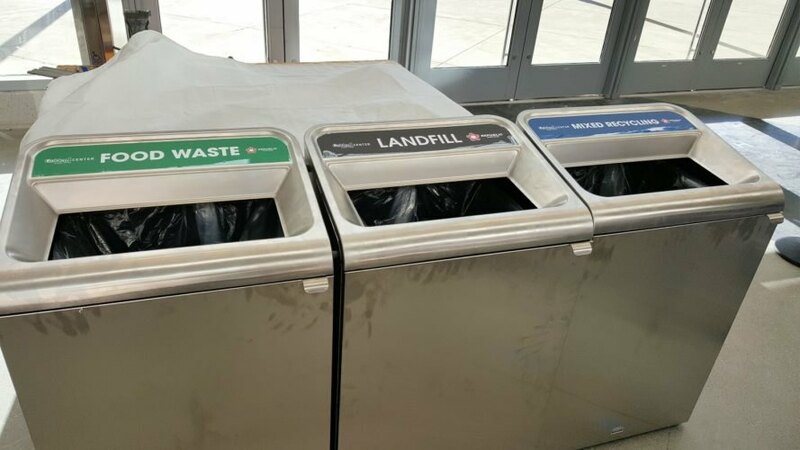 The arena's kitchen is teaming up with a local group called California Safe Soil to recycle food waste into liquid fertilizer. Art installations are found throughout the arena, including this piece, titled 2 Rivers Converging. Living wall gardens lining the exterior of the arena consist of local plants and edibles that are watered via a drip irrigation system from water runoff collected from the roof. The Kings practice facility is located at the arena. Visitors in the main concourse can watch the Kings practice through large windows. Bike racks are found outside of the arena. 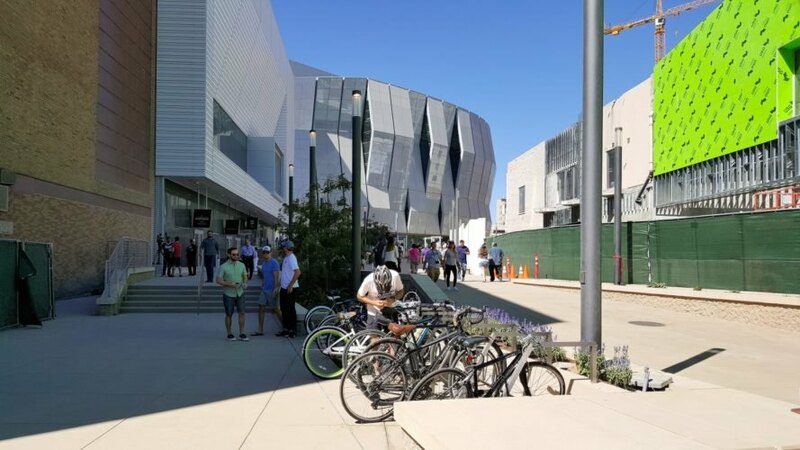 Golden 1 Center features bike valet. There are other construction projects taking place near the new Kings arena, including a Kaiser Permanente facility and a new hotel. Golden 1 Center is located in downtown Sacramento in a walkable neighborhood. The Sacramento Kings' new arena features five hangar doors at the grand entrance that open to naturally cool the building with the city's delta breeze. 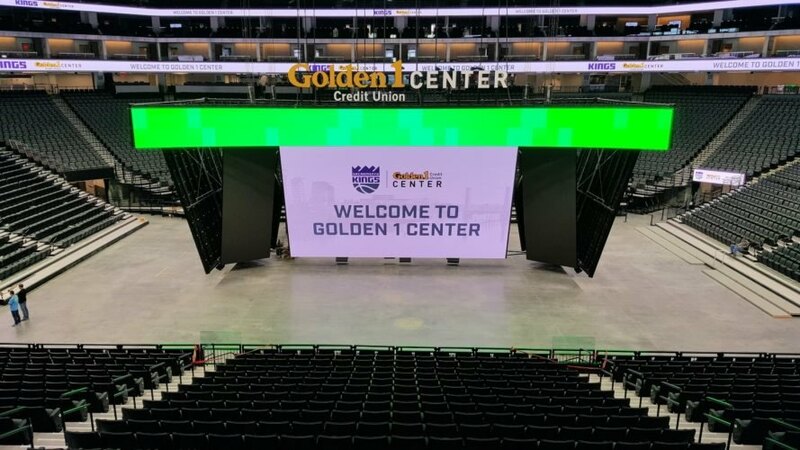 The Golden 1 Center takes into account what makes Sacramento unique, including vintage electronic signs. Spanning more than 84 feet, the total length of the video board will extend nearly the entire basketball court.